ITAGUAÍ, RJ) --- Riachuelo, the first submarine built by the Submarine Development Program (Prosub), was launched on Friday, Dec. 14. The ceremony took place in the Naval Complex of Itaguaí, in the metropolitan region of Rio de Janeiro. The event was attended by the President of the Republic, Michel Temer; the president-elect, Jair Bolsonaro; the Minister of Defense, Joaquim Silva e Luna; and the Navy commander, Admiral Eduardo Bacellar, among other civil and military authorities. The solemnity of the occasion demonstrated the significance of the project for our country. In addition to the personalities, employees of the company responsible for the construction of the submarine, Itaguaí Construções Navais, and the crew honored the first time the boat touched the waters of the ocean. In opening the ceremony, the president of Itaguaí Construções Navais, André Portalis, pointed out that "Riachuelo is a combination of French technology with the needs of the Navy. We have succeeded in this partnership to accrue concrete gains. " With 72 meters in length, six meters in diameter and 1,870 tons, the submarine, decorated with the colors of the Brazilian flag, was christened by the First Lady, Marcela Temer, who asked that the vessel and the sailors who are to embark be blessed. After several presentations regarding the origin, assembly and completion of the Riachuelo, the launch elevator was activated jointly by President Temer, his successor, Commander Leal Ferreira, and the future Minister of Mines and Energy, Admiral Bento Costa Lima. To be lowered into the sea, the boat was placed on a platform measuring 110 meters, which was lowered 10 meters from the pier by means of 34 winches. The maneuver, which took about half an hour, was carried out by more than 70 people. President Temer emphasized that the country is moving steadily towards the construction of the nuclear-powered submarine, thanks to the acquisition of high-tech expertise, which is employed not only in the military. "It also brings benefits in the fields of energy, medicine and science. Prosub is not only a fundamental element of our defense strategy. It is also an integral part of our technological development policy, "he said. For Minister Silva and Luna, in addition to the program to strengthen the national economy with the qualification of labor and the generation of jobs, it will makes Brazil remain in the select group of countries capable of building submarines. "If much has already been done, much is yet to come. Prosub goes beyond this release, something that requires perseverance, continued effort and recognition," he said. Among those who celebrated the event was electrical technician Sérgio Fernandes, 49. He worked on activating Riachuelo's batteries and said attending the launch event was gratifying. "I come from work, so this is different from all the activities I've worked on, it's a different world, too exciting. The people look ready and know that participated, is very cool, "he said. After this first contact with the ocean, the submarine will go through a series of tests before starting its first submerged mission. "We all celebrate this symbolic ceremony as one of the greatest milestones of Prosub. We celebrate this achievement for Brazilian society," said the Navy's commander. After all the tests, which will last for about two years, including at sea, the submarine will finally be incorporated into the Submarine Force, subordinate to the Commander-in-Chief of the Brazilian Fleet. With a crew of 35, 70 days of autonomy at sea and capable of diving to depths of over 300 meters, the construction of Riachuelo generated 5,000 direct jobs and 12,500 indirect ones. The submarine is the first in a series of four conventional and one nuclear submarine that the Navy will build through Prosub. The purpose of this production is to protect the 3.5 million square kilometers of territorial waters, and guarantee Brazilian sovereignty at sea. 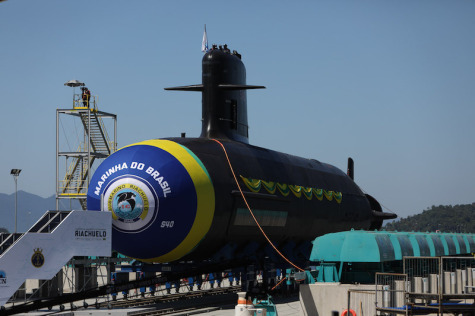 This morning, the Brazilian Navy launched its first Brazilian-built Scorpène submarine, the Riachuelo. The ceremony took place at the Itaguaí Navy base in presence of the President of the Federal Republic of Brazil and of the elected President. -- present and qualify local suppliers for the future needs of the Brazilian Navy. Scorpène is the conventional submarine designed by Naval Group for the export market. It demonstrates both Naval Group's ability to deliver best in class submarines and to conduct successful transfers of technology. Today 14 Scorpène submarines are in operational service or being built, for the Chilean Navy (2 units), the Malaysian Navy (2 units), the Indian Navy (6 units) and the Brazilian Navy (4 units).